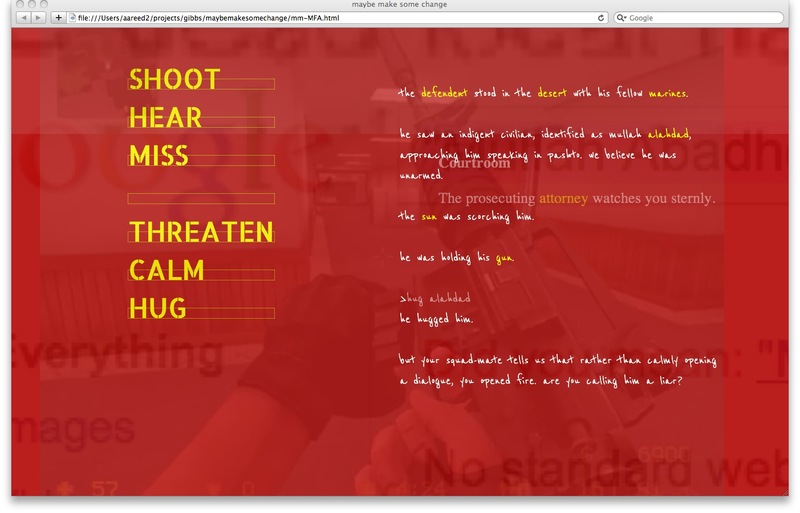 “maybe make some change” merges parser-based interactive fiction with textual and multimedia layering to produce a confrontational exploration of a true event. Inspired by the trial of Adam Winfield, a whistleblower soldier accused of murder, the piece freezes a single battlefield moment and replays it from half a dozen violently conflicting perspectives. “change” questions the trust we place in narrators, and explores the fine edge between moral and immoral acts in a war zone. Juxtaposing its text narration with both footage of first-person shooters set during contemporary wars and online social networking pages of the accused soldiers, the piece also challenges the representation of and engagement with current events in mainstream interactive media. “change” was part of the jury-award-winning “‘what if im the bad guy’ and other stories” exhibition at the 2011 UC Santa Cruz Digital Arts & New Media MFA show.